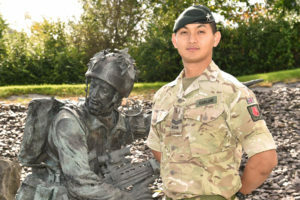 Corporal Sanjay Tamang has been a Foxhound vehicle commander as part of the Kabul Force Protection Company during 2RGR’s deployment as the Kabul Protection Unit (KPU) on Op Toral 3. For over half of his deployment he operated as a multiple second-in-command responsible for the protection of NATO Advisors operating across Kabul. He is nominated for recognition not only for his superb performance protecting NATO Advisors but also for his actions as part of the KPU Quick Reaction Force (QRF); the force which delivered emergency response to numerous incidents and attacks across Kabul. Tamang is an outstanding Junior Non Commissioned Officer who has produced an operational performance of sustained quality. Irrepressible, he has been at the heart of everything during a deployment where unseen threats lurk and risk to force is considered synonymous with risk to mission. His 100+ force protection patrols have demanded the application of the highest standards of basic but brilliant soldiering; from pre-patrol planning and checks to razor-sharp vigilance and dynamic action on the ground. Tamang has delivered it all and more. A natural leader he is the one others look to when the chips are down. For someone relatively junior in rank and experience to be held in such high esteem is a rare feat. He has been singled out for praise by numerous senior Officers and NATO Advisors; receiving the most plaudits of any under my command during Op TORAL 3. Much of this praise stems from Tamang’s magnificent professional bearing, courage and ability to instil confidence. He oozes charm and humility while projecting a steely, no-nonsense edge; an archetypal Gurkha who places the interests of others ahead of his own. There have been no force protection security incidents with those Advisors under his watch. By any measure this is mission success. Tamang was also an essential part of the Quick Reaction Force. Refining procedures, testing techniques and rigidly ensuring his troops were the best prepared, he was a force multiplier. His stand-out contribution came during a complex attack on the American University of Afghanistan; insurgents had breached the facility and were holding several hostages. With an outstanding grasp of Urdu and understanding of the Afghan psyche, he negotiated access through several Afghan National Police cordons; a task normally the preserve of the Coy Comd. On the scene he operated in the close force protection role and was chosen to execute the link-up with the in-place Special Forces. At night, in a congested and confusing battle-space in which response forces had been deliberately targeted, the scope for a fratricide accident was high. Tamang held his nerve, used his initiative to identify himself and successfully took control of the released hostages. This was an outstanding effort, seemingly simple on paper, yet complex in execution. Beyond this single-event, he deployed on numerous occasions with the QRF to a variety of incidents across the city. His was always the first name on the team sheet; a superb accolade for a top quality young leader. In what has been a challenging tour Tamang has been a shining light. At the less glamorous end of the spectrum, his work has nonetheless been crucial to the UK’s wider contribution to Afghanistan. He set the conditions for NATO Advisors to perform their duties and delivered when it counted on QRF tasks. His all-round contribution has been beyond any reasonable expectation of his rank. A great ambassador for his Battalion and the Army he is worthy of formal recognition.